SBI PO Admit Card: State Bank of India(SBI) will release the Admit Card for SBI PO Prelims exam on April 2019. SBI PO Prelims exam will be held on July 2019. candidates can download the SBI PO admit card from the official website. there will be total number of 2000 vacancies have been announced by SBI this year, PO is one of the most dreamed job for millions of the banking aspirants. SBI PO 2019 official notification will be released soon, Click Here for more details. SBI PO Admit Card for prelims examination will be release on June 2019, candidates can download the Call letter from the official website of SBI or by the given link above, the admit card will be release only in the online mode, there is no other mode to get SBI PO Admit Card, the authority will release the seperate admit card for both prelims and for the mains examination. the Admit Card for the mains examintion will be after the the 15 days prior of the SBI PO Mains examination. 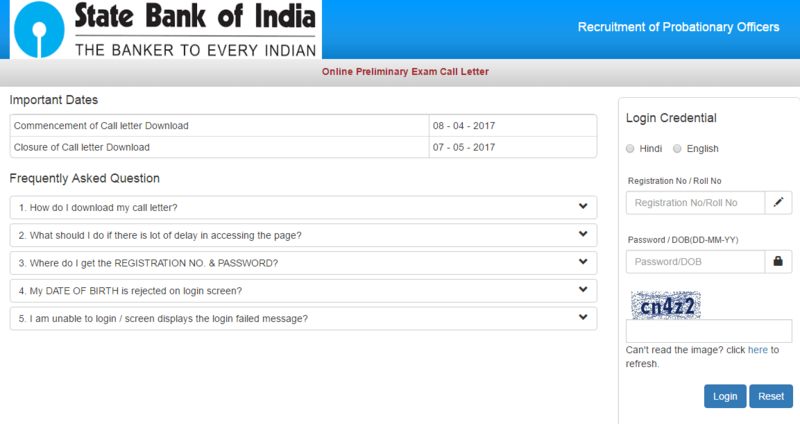 How to Download the SBI PO Admit Card? 1: Visit the official website. (Link provide above). 2: A new page will be open in a new tab. 3: Enter “Registration No.”, “Password/DOB” & ” Security Pin”. 4: After Entering the details press “Login” Button. 5: SBI PO Prelims Admit Card will be open in a new tab. 6: Save and download the Admit Card for the Future use.